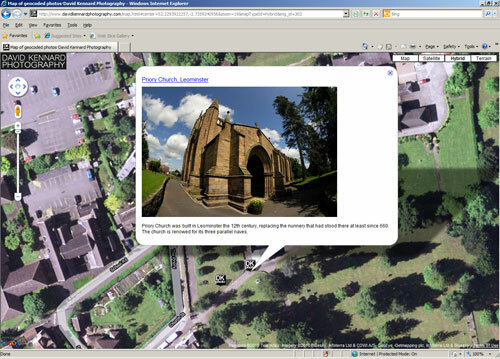 You can now browse my geocoded photos by location using Google Maps and I have also introduced an improved version of the KML for viewing the geocoded photos in Google Earth. Currently the website contains geocoded photos from the UK and Seoul, South Korea. Nearby photos are automatically clustered together depending on the zoom level. The marker colour indicates how many images are in a cluster, ranging from 42% grey for 200+ images to black for a single image. 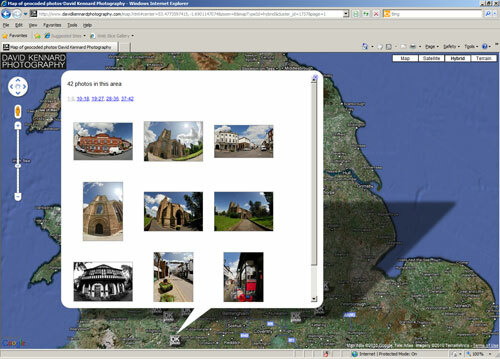 In Google Earth the info window for the photo opens before it zooms into the location where the photo was taken. 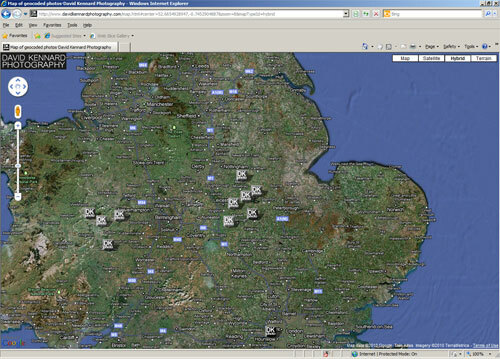 This can cause a strange wobbly effect on the info window as Google Earth zooms in. Unfortunately I haven't been able to find a fix for this yet. On the map page you can bookmark the current view as you would bookmark a normal webpage. You can also grab the url in the normal way if you want to link to the current view, e.g. here's a link to photos taken around Gyeongbokgung palace in Seoul. If you mouse over the David Kennard Photography logo in the top left corner of the map, a small navigation menu will pop out that you can use to get back to the main part of the website. In Internet Explorer 6 the markers sometimes disappear completely. Dragging the map slightly should make them reappear. Sometimes when you click a marker the info window opens but doesn't move into view. You can either click the marker again or manually drag the map to move the window into view. If you find either of these problems occuring often, find any other problems, or have any suggestions, please leave a comment below or use the contact form to send me a message. One other potential 'bug' with the map to note is that with most Internet Browsers each interaction with the map is included in the Browser history. So if you interact with the map 100 times, you would need to press the Back button 100 times to get back to the previous page you were viewing before you viewed the map. This problem is not present in Internet Explorer 6 and 7, Firefox 4, or Google Chrome 7. Update 20th November 2010: The problem with the back button not taking you back to the previous page is now fixed in most Internet Browsers except Opera.